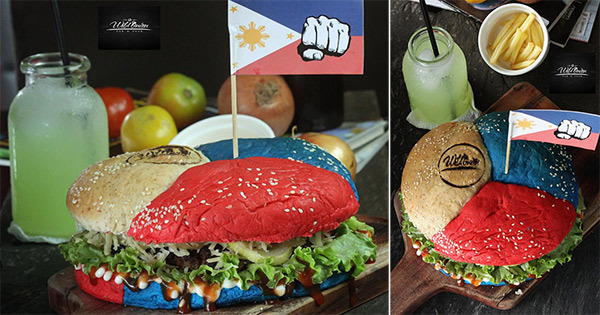 The Duterte-inspired "El Presidente" burger by Marco Paulo Culala of Wild Onion Pub & Grub in Cagayan de Oro City sure looks yummy. 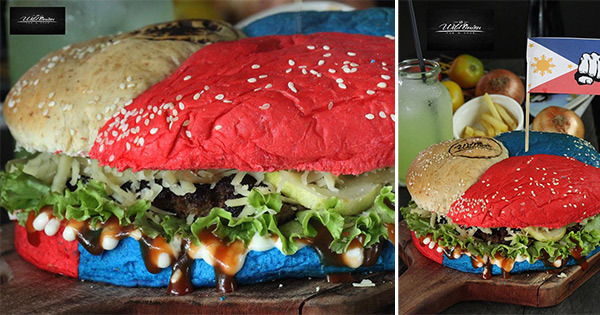 Made of an 8-inch tri-colored burger plus thick, oversized premium patty, mayonnaise and cheese, the burger costs P375. A post on the Facebook page of the pub says one order of the "El Presidente" burger is good for 4 to 6 persons and has approximately 1,950 calories. Marco Paulo, the Wild Onion Pub & Grub's executive chef and owner, said in an interview that he has not met President-elect Rodrigo Duterte but it would be his pride and honor to personally serve the customized burger to the incoming head of state. The establishment is located at CDO Centerpoint, Domingo Velez Street in CDO, the "City of Golden Friendship," and is open from 11 a.m. up to 11 p.m. seven days a week. Every time customers buy the "El Presidente" burger, a certain percentage of the sale will be donated to the mentally challenged patients of House of Hope Foundation Inc., according to the FB post.